Mash Potatoes for chefs is like a huge white canvas to a painter. There's so much more you can add to your mash then just butter (although butter is pretty great too), by adding in cheeses and spices you take the dish to a whole new level. Trust me, make my mash as this Monday night's side and your family will forget all about the entree- hey one less thing to cook right? Fold in parmesean cheese and enjoy! Are you looking for something different for dinner this Saturday? My baked ravioli and roasted garlic chicken are sure to tantalize the taste buds. Ravioli, is probably one of my favorite dishes along with rice beans hence my being half Colombian, half Italian. While scouring through my fridge I found some odds ends, left over marinara sauce, handful of mozzarella, one empire kosher chicken breast and a bag of three cheese ravioli. Like an ephiphany it came to me- Bake em! So I decide to bring all these odds and ends together to create a symphony of flavor that'll warm your belly and your heart -we sure need it with all the snow we keep getting in NYC. 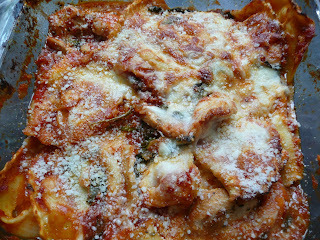 Here's my recipe for Baked Ravioli with Roasted Garlic Chicken- give it a try and send me your reply! Happy Friday people! If you didn't shovel out your car yestrday from the 12 inches of snow we got in NY on Wednesday, good luck with that today! Indeed, you will be needing something to warm you up on this frigid day- Dunkin Donuts has got us covered. 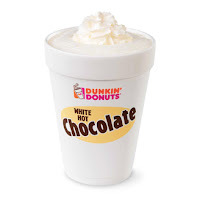 Have you tried their new White Hot Chocolate?? It's the perfect treat when winter's got you beat. Warning, Warning- it is very sweet, absolutely delish but sweet so sip it slow or share with a friend. 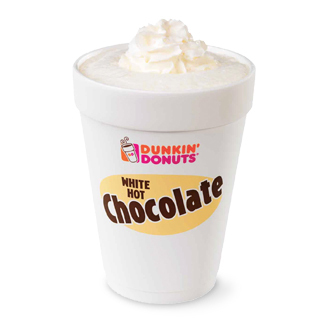 I don't know what it is about the white hot chocolate it's just so winter wonderland- what are you sippin in the storm?? Green & White inside n out! 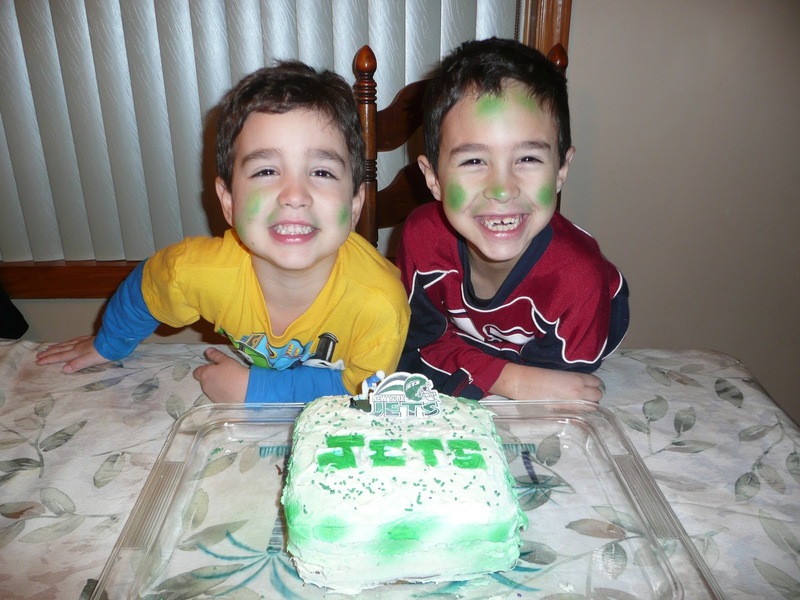 It's Thursday Night and I'm counting down to this week's episode of Jersey Shore on MTV. Get ready for T-shirt time and 60 mintues of some good trash tv. A couple of questions I have about Season 3 are: Is Sammi really goin home? Do sparks fly between J-Wow & Ron? What's the deal with new girl Deena? I can't wait for the answers to unfold! Jersey Shore airs at 10pm so that's a long time since dinner, while watching my favorite show I have been inspired to create the perfect boardwalk bite. What to eat while watching Snooki discuss her latest guido gorilla juicehead crush- well nothing says guido like a sausage and peppers hero. If you're looking to get Sitch's 6 pack I say ditch the hoagie roll and just plate it up sans the bread. I'd like to propose Winner Dinner Wednesdays! Each Wednesday I will be posting family friendly meals promised to win over your pickiest eaters.Feel free to email me with your recipe request. 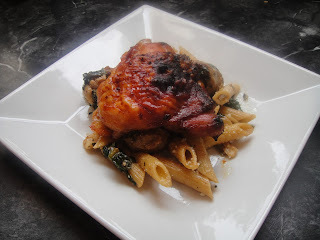 The Wednesday Winner Dinner pictured above is a personal favorite of mine- Asian Glazed Chicken over Sauteed Spinach and Penne. Have you been to your local Target lately? I can not believe all the selection of produce, meaats and frozen fish they are now carrying! It has never been easier to put together a fantasic and fit meal just by walking up and down a few aisles. Today, I am preparing a light and luscious lunch with four ingredients, picked up on my latest Target trip. Pour in Very Teryaki and Serve! Roasted Chilean Sea Bass, $20 per lb and worth every bite! c) it's almost impossible to overcook. Seriously, this is the perfect fish for the beginner cook because it is so rich and flavorful, very user friendly. The fish has a magnificent taste all on it's own therefore requires minimal seasoning. It's super rich, so it stands up well to high heat and doesn't easily fall apart. Another plus, a delicious aroma will fill kitchen while it's roasting, no stinky fishy smell here. Place in oven until cooked through. Earlier this week I told you about the Wusthof Steak Knife Set I purchased as a Christmas present for my dad. It's only right that I now tell you what I bought my mom. Ya know when the saying "oh, she gets it from her momma", yeah well I sure did get my passion for cooking from her! Growing up my mom was always in the kitchen , she cooked eveything from scratch- it wasn't until I was a teenager did I even know boxed mash potatoes existed! I love how the 1 1/2 qt sauce pot coemes with a lid that strains, great for pasta, soup or sauce!!! What could use a slight drop of improvement- the weight of the pots. 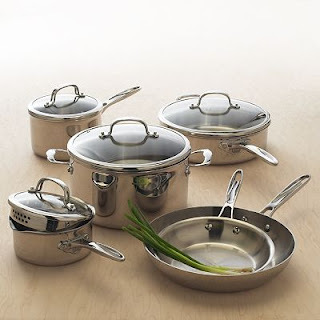 This is some serious cookware and I would expect nothing less from my friends at Food Network but the pots are a bit on the heavy side.Partly why they cook so well but at the same time, be sure to use two hands when you're picking them up! Saty tuned for some of the latest dishes I prepared in the new cookware! So tell me what are you cooking in your lastest cookware set! People put this address is you navigation!!!! I just had lunch at American Burger in Rockville Center- home of the 7oz burger! Let me tell you- this is one serious burger joint! It's a small, how do you say- hole in the wall, dive, kind of place -which of course are the BEST kind! There is a burger from each state on the menu, I indulged in the Mississippi Burger,it's packed with with cheddar, mushrooms and onions!! OMG it was heavenly! They start with US Grade Prime beef which is perfectly seasones and topped with melty cheddar, (tons and I mean tons) of grilled mushrooms and onions!!! My friend ordered the Indiana burger- which is topped with Virgina ham, smothered with cheddar and grilled onions- HOMERUN! Now I rarely blog about a place without a picture of the meal but today I left my camera home and this place was just so fantastic - I just had to go ahed and let ya'll know!! This is one BANGIN' Buger- go grab a bite!!! There on Chef's Catalog, I found the most perfect 8 piece stainless steel knife set by Wusthof in a wooden gift box- jackpot! Priced at ($79.95) and free shipping I knew this was it. Let me tell you when my set arrived, man was I pleased! This set is of great quality, nice heavy knives and a great presentation box. Then I thought, how can I give my dad steak knives without a couple of steaks! To complete my gift ensemble I pciked up (2) U.S. Grade Prime, Rib- Eye Steaks, 1 bottle of Ruffino Chianti and 1lb. of fresh boccacini from the Pork Store. Let me tell you those knives stood up quite nicely to that juicy rib-eye pictured above!